The Auto Marketing Blog: Is Twitter Right for Automotive Marketing? I have been following Twitter for a short while, about three months (you’re welcome to follow me @cbaccus.) So, please understand that I am not a Twitter evangelist. I’m also not anti-Twitter. I simply want to learn what is effective and see what brands (particularly automotive brands) are doing on this channel. So far, there are a couple of efforts that have caught my attention. One is the work of Scott Monty, the social media person from Ford’s PR team, to see what he is doing to promote Ford’s brands on Twitter. The other efforts come from product launch “trials”. 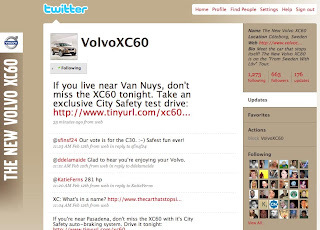 Volvo recently started a XC60 Twitter account and so has Nissan with their Nissan Cube launch. They are two efforts that are using Twitter to try to gain an audience. First let’s look at Scott’s endeavors at Ford. For disclosure purposes, Scott is a client of mine in a round about way. I don’t work directly with him but I work for the agency of record on the Ford marketing account and have met Scott, but I don’t know him well nor have I worked on any direct projects with him. I just have simply observed by following his blog and Twitters. This week Scott is getting trashed by Jalopnik, a very popular automotive blog. The dig was mainly one about the power of Twitter as a way to sell cars along with some personal attacks focused around Scott’s strong ability to self promote. I’ll focus on the selling cars part of the criticism levied by Ray Wert of Jalopnik who questions if Monty’s efforts really impact automotive sales. From listening to Scott, he has established some strong relationships on Twitter and claims to have had some impact on changing Ford’s brand perception through his communications with those who have forgotten about Ford or have a negative perception of Ford from prior experience. The most public example is Scott’s traction with technology blogger Scobleizer. Scott is a PR guy at Ford. So, he is primarily focused on improving Ford’s image by influencing media coverage. Improving the brand’s image should eventually result in increased sales and, yes, it may take years to really have any significant impact on sales. But I wouldn’t call what Scott is doing marketing. He is doing public relations. The other efforts by Volvo and Nissan are truly marketing efforts. Volvo’s communications on Twitter 90% of the time promote drive events where the new vehicle is being toured around the States and the marketing team is using Twitter to promote event location and timing. If you are not interested in these events or are too much of a Twitter fanatic that you can’t just look up the event location on Volvo’s XC60 blog than the Twitter follow loses all value. The other 10% of posts comment on questions people ask the account administrator. Nissan’s effort was to create a personality for the vehicle. They Tweeted (is that what it’s called?) witty phrases that imitated the car’s personality. It was rather urbane stuff, but for the Nissan Cube fanatics I’m sure it was kind of fun for them and probably produced a grin or two every time a new Tweet came across. Plus the Tweets kept the vehicle in the consumer’s mindset. The problem is very few people followed it with barely a 100 followers, and considerably less once you exclude the agency and Nissan employees who followed it. The above examples are not sweeping endorsements of Twitter for automotive marketing, but don’t give up just yet. Understanding why Twitter is even considered right for marketing in social media is still important to automotive brands. There seem to be two dominant, related themes that are drawing brands to Twitter. 1.) The Power of Relationship Marketing that has been promoted in books like Groundswell. So Twitter is about relationships and it’s about word of mouth impact. Some brands are finding success through Twitter by leveraging the popularity of Twitter advocates. American Express recently started Open Forum, an online community for small business owners with Guy Kawasaki a well-known author and entrepreneur, writing for the community. Kawasaki has also leveraged Twitter and has attracted roughly 60,000 people, who follow Guy on Twitter, to the Open Forum site. Examples like this is creating a lot of buzz showing the power of Twitter to attract eyeballs to corporate website endeavors. It’s not the only avenue to promote the site; it’s simply part of the marketing strategy. Is It a Medium Worth Automakers Time? So can automotive brands find success in this space? Possibly. I would think more success will come from efforts that are about long-term relationships than setting up temporary Twitter accounts for a vehicle’s launch, those will die when the launch budget dries up and besides relationships take time. I do like how Scott Monty created accounts around different themes for the Ford brand, like @FordDriveGreen. Unfortunately, very little is posted on these Ford branded Twitter accounts and most of the Ford communications are done via the @ScottMonty account. So, very little relationship marketing is happening from a branded account; instead one person is becoming the relationship, which is risky especially when Ford and Scott part ways. That said, there is hope that relationship building could happen and could positively impact a brand’s perception if it is an early adopter, which is something Scott Monty is trying to do at Ford by using Twitter so extensively. I agree with Scott’s approach that Twitter is about building relationships and relationship marketing is a driving force that does have some success stories and will have more, even in the automotive world… eventually. Provided they are done right with an achievable goal, effective branding, developing meaningful relationships through honest dialog, and by participating in social media beyond just promoting your marketing driver events. Chris, thanks for taking the time to write about this. It's an area that lots of folks have been questioning lately - the personal vs. the corporate accounts. I constantly refer back to the column that Alan Wolk wrote, Your Brand Is Not My Friend in which he basically said that no one wants to be friends with a cheeseburger (or a car). People like to talk to people - usually people similar to themselves. So if a marketer can get out there and be a real person, whether it's through a corporate account or through their own, the end result is what matters. Do people believe what they're saying and have they changed perceptions? My use of Twitter is definitely communications and not marketing. The origin of the word communicate comes from the Latin communicare, meaning "to make common." This is typically done not through one-way messaging but through dialog - the best way for people to come to a common understanding. Yes, we have a number of corporate branded Twitter accounts. These haven't yet been active because I haven't had the time or resources to train the various staff members who'll be using them. But it's very much top of mind and key to our plans this year. Expect to see more soon, as well as a page of all of our Twitter accounts listed on The Ford Story. I think this topic is very interesting because we are still so early in how best to promote a brand on Twitter and thank you for your strategic approach as it is bringing the topic to the forefront. I wonder if your efforts would be less confrontational to some if the Twitter account you communicated from was something similar to what Honda is doing with @Alicia_at_Honda, @Scott_at_Ford. Maybe this is a happy medium because you do become "friends" with a person not just a logo. Anyway, thanks for sharing your thoughts on the topic and keeping the dialog going.